Russia is still looking for a way to conquer Ukraine, using the mechanisms of the democratic state. This is a very dangerous reality. This was stated by the Father and Head of the Ukrainian Greek Catholic Church His Beatitude Sviatoslav in an interview with the Polish Catholic Information Agency. Speaking on the topic of the election campaign in Ukraine, the Primate noted that today the Ukrainian society reminds him of a large volcano, in which different worldviews, hot political debates coexist, etc. "This volcano still explodes, because the internal political tension is strong. In my opinion, the most important thing for Ukraine is the need to build a real political system," added the Head of the Church. According to him, Ukraine never had real political parties. "We had groups formed by certain politicians, supported by certain oligarchs. This was the source of political corruption. Because if there is a unification of the business oligarchy and state policy, then this is the source of corruption. It is not about the good of people and about the whole nation, but about the good of certain groups that care for themselves. I think that after this election a new political quality of Ukraine will come. I hope for this," said His Beatitude Sviatoslav. At the same time, the Primate noted that today there is a serious danger for Ukraine. "There is a state behind us, which is ready to invest a lot of money in the upcoming election campaign today. And this country is not Poland, nor the United States, nor even the Vatican, it is Russia. This is a country that is still looking for a way to conquer Ukraine, using the mechanisms of the democratic state today. This is a very dangerous reality," said the spiritual leader of Ukrainians. According to the Head of the Church, Ukraine is striving today to build a real European model of democracy. 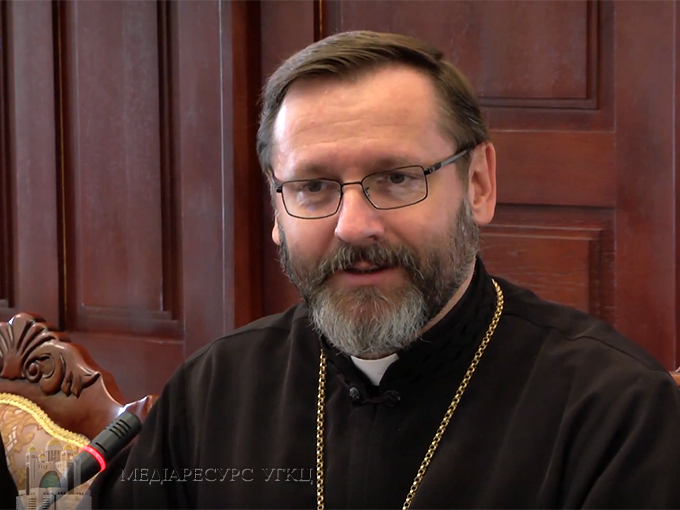 "In recent years," noted His Beatitude Sviatoslav, "together with other Ukrainian Churches, we initiated the National Forum for the Transformation of Ukraine. We would like the civil society to specify what it expects from the politicians and the state itself. We asked the question of which model of our national existence we want to support and implement. This model is determined by the Copenhagen criteria. These are the criteria according to which a state can or can not be admitted to the European Union. " According to him, the purpose of the Churches and other civil society organizations is that those who can not take responsibility for the implementation of such a model must not come to power in Ukraine. "I am convinced that most politicians have a chance to implement this project. Others have no chance if there is no major political corruption on the part of Moscow. Ukrainian public opinion clearly states that we want to be a sovereign state, we want to be a European state, because we are a state with a completely separate culture from Russia. Our sovereignty must be protected and developed," said His Beatitude Sviatoslav.